Where Did Philoctetes Get His Bow? Compared with the modern theater, ancient Greek tragedies employ few props. Those that are used, however, are crucial: Creusa's basket, Clytemnestra's tapestries, the note in Phaedra's hand. One of the most storied props in the classical theater is Philoctetes' bow. 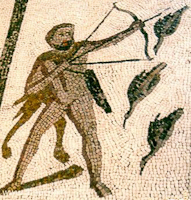 The bow and its history are central to the plot of Sophocles' Philoctetes. Soon after they land on Lemnos, Odysseus explains to young Neoptolemus the importance of retrieving the bow—without it, Troy cannot be taken. A comrade later explains that Odysseus learned this from Helenus, the prophet son of Priam, whom Odysseus had captured. and burn it on what they call the Lemnian fire. Neoptolemus, of course, does not end Philoctetes' life. He waits through his sleep, repents his deception, and returns the bow to its owner, much to the chagrin of his captain, Odysseus. As Neoptolemus and Philoctetes prepare to desert the Greek army for home, the spirit of Heracles intercedes, commanding them to return to Troy—Philoctetes to be healed and to kill Paris with his bow, and Neoptolemus to serve as his companion. The spirit says that this will be the second time Troy falls to the bow and arrows of Heracles, but we must leave that tale to another time.